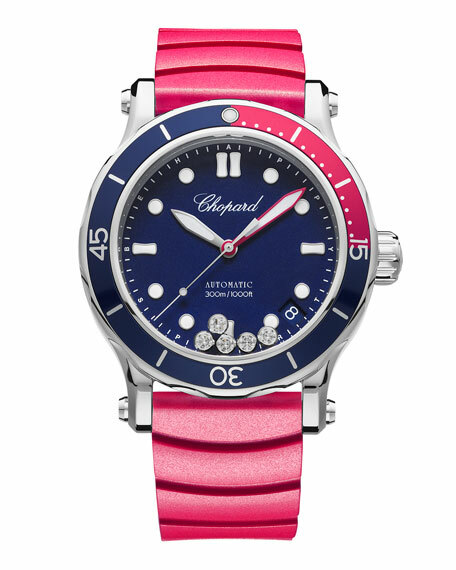 As technical as it is fun, it is water-resistant to 300 meters and beats to the rhythm of a self-winding Chopard movement. Combined with a large 40 mm steel case, the unidirectional rotating bezel with its blue-raspberry coloring is inspired by azure blue shades and brightly colored corals, while featuring a wave-shaped design for easier handling under water. The screw-down crown is marked with a C and the case-back is engraved with a wave motif. The intense blue dial brings to mind the ocean depths and is enhanced with a white minutes hand hemmed with raspberry that glows at night or in dark, deep waters. 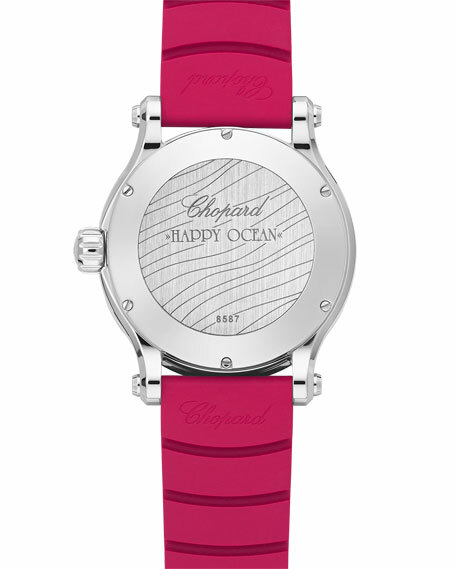 Chopard "Happy Ocean" sport automatic watch. Hour-markers and hands illuminate with a blue hue, with all other indications required for diving in green. Five moving diamonds, like oxygen bubbles or tiny sparkling fish, swim around this beautiful aquarium. Interchangeable rubber and blue fabric straps. Indications: hours and minutes, seconds, date. Power Reserve of approximately 60 hours. Frequency: 4 Hz (28,800 vibrations per hour).